Blood Fever is spreading across the UK with the release of the second Young James Bond novel. MI6 Exclusive: limited edition collectors cards revealed! 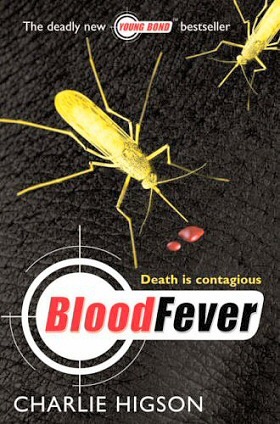 Blood Fever is spreading across the UK as Charlie Higson's second Young James Bond novel fly's off shelves in bookstores. Book chain Waterstones are offering an exclusive pack of collectors cards in copies of SilverFin. The silver packets contain 5 random cards which can be traded with other readers, each with a character design by artist Kev Walker and a quote from the book on the reverse. 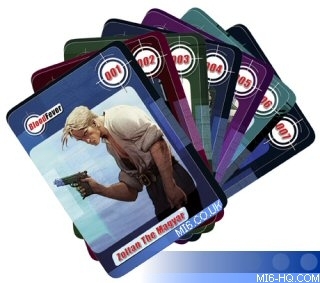 The full set consists of six standard cards and a special limited edition #007 card featuring Young Bond. 10,000 copies of the book contain the card packs in Waterstones, but only 2,000 contain the special #007 card. Rival bookstore Ottakers in the UK are also offering a special limited edition bonus to readers who pick up the novel at their stores. 3,000 copies of Blood Fever have been signed by author Charlie Higson and are available to buy in their stores across the country. As with SilverFin, "dumpbins" were created featuring the book cover artwork and have been placed in selected stores. Top Waterstones chains also feature window displays containing blowups of the front cover art and window stickers. Look out for the Blood Fever poster campaign throughout the London Underground at the end of January.